Nixon is a 1995 American epic biographical film directed by Oliver Stone for Cinergi Pictures that tells the story of the political and personal life of former U.S. President Richard Nixon, played by Anthony Hopkins. The film implies that Nixon and his wife abused alcohol and prescription medication. Nixon's health problems, including his bout of phlebitis and pneumonia during the Watergate crisis, are also shown in the film, and his various medicants are sometimes attributed to these health issues. The movie also hints at some kind of responsibility, real or imagined, that Nixon felt towards the John F. Kennedy assassination through references to "the Bay of Pigs", the implication being that the mechanisms set into place for the invasion by Nixon during his term as Dwight D. Eisenhower's vice-president spiraled out of control to culminate in the assassination and, eventually, Watergate. The film ends with Nixon's resignation and famous departure from the lawn of the White House on the helicopter, Army One. Real life footage of Nixon's state funeral in Yorba Linda, California plays out over the extended end credits, and all living ex-presidents at the time, Gerald Ford, Jimmy Carter, Ronald Reagan, George H. W. Bush, and then-president Bill Clinton, are shown in attendance. The studio did not like Stone's choice to play Nixon. They wanted Tom Hanks or Jack Nicholson — two of Stone's original choices. The director briefly considered Gene Hackman, Robin Williams, Gary Oldman and Tommy Lee Jones. Stone met with Warren Beatty but the actor wanted to make too many changes to the script. Stone cast Hopkins based on his performances in The Remains of the Day and Shadowlands. Of Hopkins, Stone said, "The isolation of Tony is what struck me. The loneliness. I felt that was the quality that always marked Nixon." When the actor met the director he got the impression that Stone was "one of the great bad boys of American pop culture, and I might be a fool to walk away." What convinced Hopkins to ultimately take on the role and "impersonate the soul of Nixon were the scenes in the film when he talks about his mother and father. That affected me." When Beatty was thinking about doing the film, he insisted on doing a reading of the script with an actress and Allen was flown in from New York City. Afterwards, Beatty told Stone that he had found his Pat Nixon. Woods talked Stone into giving him the part, a role that the director had planned to offer Ed Harris. Larry Hagman as "Jack Jones"
Unlike some other characters in the film who represent actual people, Jack Jones, a billionaire investment banker and real estate tycoon, is a composite character, who is emblematic of "big business" in general. The character may be a reference to Nixon's meetings with Clint Murchison, Sr., although he also illuminates Nixon's relationships with Howard Hughes, H. L. Hunt and other entrepreneurs. Eric Hamburg, former speechwriter and staff member of the House Foreign Affairs Committee, got the idea of a film about Nixon after having dinner with Oliver Stone. Originally, Oliver Stone had been developing two projects — the musical Evita and a movie about Panamanian dictator Manuel Noriega. When they both did not get made, Stone turned his attention to a biopic about Richard Nixon. The former President's death on April 22, 1994, was also a key factor in Stone's decision to make a Nixon film. He pitched the film to Warner Bros., but, according to the director, they saw it, "as a bunch of unattractive older white men sitting around in suits, with a lot of dialogue and not enough action". I see the Beast in its essence as a System ... which grinds the individual down ... it's a System of checks and balances that drives itself off: 1) the power of money and markets; 2) State power, Government power; 3) corporate power, which is probably greater than state power; 4) the political process, or election through money, which is therefore in tow to the System; and 5) the media, which mostly protects the status quo and their ownership's interests. It was this concept that convinced Stone to make Nixon and he told Hamburg to hire Rivele and Wilkinson. Stone commissioned the first draft of the film's screenplay in the fall of 1993. Rivele and Wilkinson delivered the first draft of their script on June 17, 1994, the anniversary of the Watergate scandal. Stone loved the script but felt that the third act and the ending needed more work. They wrote another draft and delivered it on August 9, the 20th anniversary of Nixon's resignation. Stone immersed himself in research with the help of Hamburg. With Hamburg and actors Hopkins and James Woods, Stone flew to Washington, D.C. and interviewed the surviving members of Nixon's inner circle: lawyer Leonard Garment and Attorney General Elliot Richardson. He also interviewed Robert McNamara, a former Secretary of Defense under the Kennedy and Johnson administrations. The director also hired Alexander Butterfield, a key figure in the Watergate scandal who handled the flow of paper to the President, as a consultant to make sure that the Oval Office was realistically depicted, former deputy White House counsel John Sears, and John Dean, who made sure that every aspect of the script was accurate and wrote a few uncredited scenes for the film. Butterfield also appears in a few scenes as a White House staffer. To research their roles, Powers Boothe, David Hyde Pierce and Paul Sorvino talked to their real-life counterparts, but J.T. Walsh decided not to contact John Ehrlichman because he had threatened to sue after reading an early version of the script and was not happy with how he was portrayed. Hopkins watched a lot of documentary footage on Nixon. At night, he would go to sleep with the Nixon footage playing, letting it seep into his subconscious. Hopkins said, "It's taking in all this information and if you're relaxed enough, it begins to take you over." Stone originally had a three-picture deal with Regency Enterprises which included JFK, Heaven and Earth, and Natural Born Killers. After the success of Killers, Arnon Milchan, head of Regency, signed Stone for three more motion pictures. Stone could make any film up to a budget of $42.5 million. When Stone told Milchan that he wanted to make Nixon, Milchan, who was not keen on the idea, told the director that he would only give him $35 million, thinking that this would cause Stone to abandon the project. Stone took the project to Hungarian financier Andrew G. Vajna who had co-financing deal with Disney. Vajna's company, Cinergi Pictures, were willing to finance the $38 million film. This angered Milchan who claimed that Nixon was his film because of his three-picture deal with Stone and he threatened to sue. He withdrew after Stone paid him an undisclosed amount. Stone was finalizing the film's budget a week before shooting was to begin. He made a deal with Cinergi and Disney's Hollywood Pictures in order to supply the $43 million budget. To cut costs, Stone leased the White House sets from Rob Reiner's film, The American President. 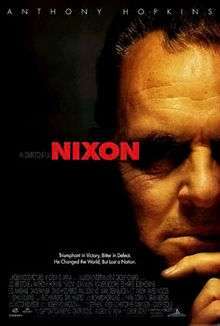 The film began shooting on May 1, 1995 but there was a week of pre-shooting at the end of April to film scenes that would be used as part of a mock documentary about Nixon's career. Early on during principal photography, Hopkins was intimidated by the amount of dialogue he had to learn, that was being added and changed all the time as he recalled, "There were moments when I wanted to get out, when I wanted to just do a nice Knots Landing or something." Sorvino told him that his accent was all wrong. Sorvino claims he told Hopkins that he thought "there was room for improvement" and that he would be willing to help him. Woods says that Sorvino told Hopkins that he was "doing the whole thing wrong" and that he was an "expert" who could help him. Woods recalls that Sorvino took Hopkins to lunch and then he quit that afternoon. Hopkins told Stone that he wanted to quit the production but the director managed to convince him to stay. According to the actors, this was all good-natured joking. Woods said, "I'd always tell him how great he was in Psycho. I'd call him Lady Perkins all the time instead of Sir Anthony Hopkins." In Spring of 1994, Time magazine reported that an early draft of the screenplay linked Nixon to the assassination of President John F. Kennedy. The facts contained in the script were based on research from various sources, including documents, transcripts and hours of footage from the Nixon White House. Dean said about the film's accuracy: "In the larger picture, it reflected accurately what happened." Stone addressed the criticism of fictional material in the film, saying, "The material we invented was not done haphazardly or whimsically, it was based on research and interpretation." John Taylor, head of the Nixon Presidential Library, leaked a copy of the script to Richard Helms, former Director of the CIA, who threatened to sue the production. In response, Stone cut out all scenes with Helms from the theatrical print and claimed that he did for "artistic reasons" only to reinstate this footage on the home video release. During the post-production phase, Stone had his editors in three different rooms with the scenes from the film revolving from one room to another, "depending on how successful they were". If one editor wasn't successful with a scene then it went to another. Stone said that it was "the most intense post- I've ever done, even more intense than JFK" because they were screening the film three times a week, making changes in 48–72 hours, rescreening the film and then making another 48 hours of changes. In its opening weekend, Nixon grossed a total of $2.2 million in 514 theaters. As of December 19, 2006, the film had grossed a total of $13.6 million in the United States and Canada, well below its $44 million budget. The film received generally positive reviews from critics and holds a 75% rating at Rotten Tomatoes. Two days before the film was released in theaters, the Richard Nixon Library and birthplace in Yorba Linda, California issued a statement on behalf of the Nixon family, calling parts of the film "reprehensible" and that it was designed to "defame and degrade President and Mrs. Nixon's memories in the mind of the American public". This statement was based on a published copy of the script. The statement also criticized Stone's depiction of Nixon's private life, that of his childhood, and his part in planning the assassination of Fidel Castro. Stone responded that his "purpose in making the film, Nixon was neither malicious nor defamatory", and was an attempt to gain "a fuller understanding of the life and career of Richard Nixon — the good and the bad, the triumphs and the tragedies, and the legacy he left his nation and the world". Walt Disney's daughter, Diane Disney Miller, wrote a letter to Nixon's daughters saying that Stone had "committed a grave disservice to your family, to the Presidency, and to American history". Stone does not see his film as the definitive statement on Nixon but as "a basis to start reading, to start investigating on your own". Some critics took Stone to task for portraying Nixon as an alcoholic, though Stone says that was based on information from books by Stephen Ambrose, Fawn Brodie, and Tom Wicker. Film critic Roger Ebert praised the film for how it took "on the resonance of classic tragedy. Tragedy requires the fall of a hero, and one of the achievements of Nixon is to show that greatness was within his reach". Ebert also placed the film on his list of the top ten films of the year. Janet Maslin from The New York Times praised Anthony Hopkins' performance and "his character's embattled outlook and stiff, hunched body language with amazing skill". However, Mick LaSalle in the San Francisco Chronicle, felt that "the problem here isn't accuracy. It's absurdity. Hopkins' exaggerated portrayal of Nixon is the linchpin of a film that in its conception and presentation consistently veers into camp". Richard Corliss, in his review for Time, also had a problem with Hopkins' portrayal: "Hopkins, though, is a failure. He finds neither the timbre of Nixon's plummy baritone, with its wonderfully false attempts at intimacy, nor the stature of a career climber who, with raw hands, scaled the mountain and was still not high or big enough." Peter Travers of Rolling Stone wrote: "It's gripping psychodrama — just don't confuse Nixon with history." It was nominated for four Academy Awards: Best Actor in a Leading Role (Anthony Hopkins), Best Actress in a Supporting Role (Joan Allen), Best Music, Original Dramatic Score and Best Writing, Screenplay Written Directly for the Screen. Entertainment Weekly ranked Nixon #40 on their "50 Best Biopics Ever" list and one of the 25 "Powerful Political Thrillers". A director's cut was released on DVD with 28 minutes of previously deleted scenes restored. Much of the added time consists of two scenes: one in which Nixon meets with Central Intelligence Agency director Richard Helms (played by Sam Waterston) and another on Tricia Nixon's wedding day, where J. Edgar Hoover persuades Nixon to install the taping system in the Oval Office. The film was re-released by Walt Disney Studios Home Entertainment on DVD and Blu-ray Disc on August 19, 2008 with the first anamorphic widescreen version of the film in North America. 1 2 3 4 5 6 7 8 9 10 11 12 13 14 15 16 17 18 Hamburg, Eric (2002). "JFK, Nixon, Oliver Stone & Me". Public Affairs. 1 2 3 4 5 6 7 8 9 10 McGuire, Stryker; David Ansen (December 11, 1995). "Hollywood's Most Controversial Director Oliver Stone Takes on Our Most Controversial President Richard Nixon". Newsweek. 1 2 3 Wilner, Norman (December 15, 1995). "Richard Nixon Gets Stoned". Toronto Star. ↑ Carr, Jay (December 17, 1995). "Perfectly Clear". Boston Globe. ↑ Fuchs, Cindy (December 28, 1995 – January 4, 1996). "Nixon". Philadelphia City Paper. Retrieved 2009-04-16. ↑ Sharrett, Christopher (Winter 1996). "Nixon". Cineaste. Retrieved 2009-04-16. 1 2 3 4 Weinraub, Bernard (December 17, 1995). "Professor Stone Resumes His Presidential Research". New York Times. 1 2 3 Smith, Gavin (March 1995). "The Dark Side". Sight and Sound. 1 2 Carnes, Mark C (Fall 1996). "Past Imperfect: History According to the Movies". Cineaste. XXII (4). Retrieved 2009-03-18. 1 2 3 4 5 6 7 Weiskind, Ron (December 24, 1995). "Hopkins Takes Presidential Duties Seriously". Pittsburgh Post-Gazette. 1 2 3 Kit, Zorianna (October 29, 1995). "Stars Come Out for Hollywood Premiere". Toronto Sun. ↑ "Nixon". Box Office Mojo. September 26, 2007. Retrieved 2007-09-26. 1 2 3 Weinraub, Bernard (December 19, 1995). "Nixon Family Assails Stone Film as Distortion". New York Times. ↑ Weiskind, Ron (December 24, 1995). "Casting Stone at Nixon". Pittsburgh Post-Gazette. ↑ Ebert, Roger (December 20, 1995). "Nixon". Chicago Sun-Times. Retrieved 2006-12-19. ↑ Maslin, Janet (December 20, 1995). "Stone's Embrace of a Despised President". The New York Times. Retrieved 2006-12-19. ↑ LaSalle, Mick (July 12, 1996). "Oliver Stone's Absurd Take on Nixon". San Francisco Chronicle. Retrieved 2006-12-19. ↑ Corliss, Richard (December 18, 1995). "Death of a Salesman". Time. Retrieved 2008-08-20. ↑ Travers, Peter (December 20, 1995). "Nixon". Rolling Stone. Retrieved August 15, 2014. ↑ "50 Best Biopics Ever". Entertainment Weekly. Retrieved 2016-02-17. ↑ "Democracy 'n' Action: 25 Powerful Political Thrillers". Entertainment Weekly. Retrieved 2016-02-17.